Home Retailing Who’s Winning Philippines’ E-commerce Arena: Local or International Players? via iPrice Group [Negosentro] Lazada leads Philippines’ top e-commerce while majority are local players. Companies from small and medium enterprises (SME) to giant corporations are shifting to e-commerce to broaden their consumer base despite Philippines’ “mall culture”. The Philippine e-commerce has the lowest retail e-commerce sales share against SEA markets but shows potential with its growing internet and smartphone penetration, rising middle class and young population. According to Google-Tesmark Holdings joint research, Philippines’ e-commerce market share will reach 9.7 Billion- 11.05% of SEA projected digital economy in 2025. As Philippine retail industry continue to harness the power of e-commerce, iPrice Group mapped Philippines’ top retail e-commerce online reach by analyzing website traffic through SimilarWeb, Google application downloads and their respective Facebook, Twitter and Instagram followers. Our analysis showed that 83 percent of the top 48 e-commerce are local players while 89 percent have more Facebook followers and less website traffic. 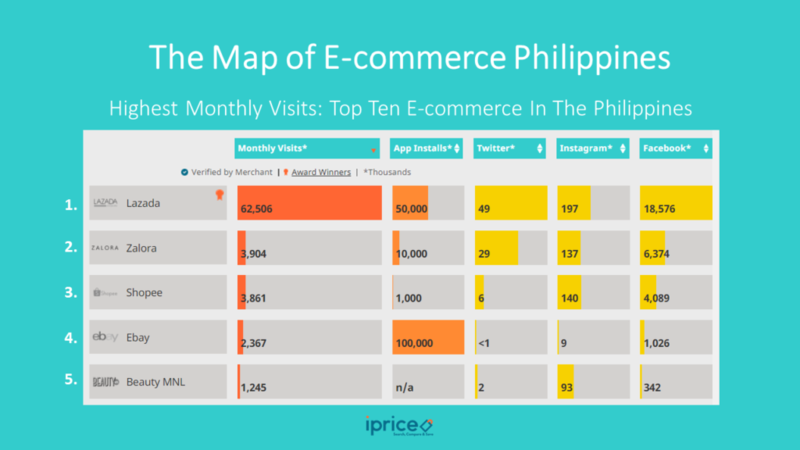 Overall, Lazada is the country’s leading retail e-commerce in terms of website traffic followed by Zalora, Shopee, eBay while BeautyMNL tops local e-commerce. According to SimilarWeb’s Q2 average monthly traffic, Lazada is the country’s most visited e-commerce and by far the only retail e-commerce to amass more than 60 million monthly average visitors, surpassing Zalora, Shopee, and eBay with at most 30-fold lead. Despite the entry of Amazon in SEA through Singapore last July, Alibaba-backed Lazada remains confident for its market-specific knowledge in the region. In the Philippine markets, Lazada’s strategy will remain to solidify its brand, assortment of products and logistics infrastructure, says Inanc Balci, Lazada Philippines CEO. Last October 11, Taobao Collection, run live in Lazada Philippines following its launch in Indonesia (which will be available in Thailand by November), offering the diverse inventory of Alibaba Group. The Philippines two largest retail conglomerates Ayala Group and JG Summit acquired Zalora Philippines and Shopee Philippines, the second and third most visited e-commerce sites on the list. Ayala Group owner of Ayala Malls holds a controlling stake of 49-percent in Zalora Philippines, paving Ayala Malls’ partner stores leverage to e-commerce through Zalora platform. Zalora on the other hand, gained an access to Ayala’s technology for digital payments through Globe GCash. Meanwhile, the Gokongwei-led conglomerate, JG Summit acquired a significant stake in Shopee Philippines, a Singapore-based e-commerce. Majority of Shopee’s recent fundings will be leveraged in the growth of its e-commerce platform especially for its key markets. Established in 2015, Shopee is the youngest e-commerce on the list but amassed over two million sellers across SEA due to its free product listing and shipping. Shopee is the fourth most downloaded application on the list for its peer to peer key feature. 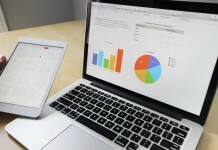 In terms of application downloads, Ebay leads the top e-commerce list with a whopping 500 million users. Established in 2014, Beauty MNL is the most visited youngest local e-commerce in the top 10. Unlike its competition Sephora, Beauty MNL has its own beauty and skincare magazine called Bloom, which publishes localized content daily. According to the Digital Marketing Philippines, the most effective channels in digital marketing are social media ads, social media and content marketing. 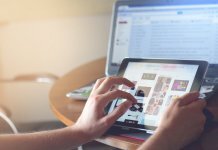 “Companies and brands who want to succeed in social media marketing should understand that one of its critical component is content”, says Shayne Garcia, Managing Director of iProspect. While website traffic is the key determining factor in the top retail e-commerce list, social media also played a crucial factor in the growth of the country’s top e-commerce as 18 percent of the 40 local players initially started on Facebook and Instagram. Social commerce or sales driven by social media is expected to increase in SEA over the coming years despite that it is only 30% of the total online sales in 2016. The top five e-commerce on the list: Lazada, Zalora, Shopee, Ebay and Beauty Manila have a million-monthly average traffic each while Goods, Galleon, Takatack, Sephora and Kimstore, only have around 200,000 to 300,000 monthly average traffic. However, in terms of Facebook followers the local players in the top 10: Goods, Galleon, Takatack and Kimstore, have more than a million followers on Facebook. 43 out of the top 48 e-commerce on the list have more Facebook followers and less website traffic; only five e-commerce (Lazada, Ebay, Beauty MNL, Galleon and Easy Shop), have more monthly visits. Even Melissa Philippines, in 39th place in terms of website traffic (less than 10,000), placed third on Facebook behind Lazada and Zalora with almost 6 million followers. Similarly, Eazy Fashion reached a million of followers despite its low traffic (less than 95,000). According to wearedigital.com, Facebook Messenger recently doubled its active users taking over Viber Philippines as Philippines’ top messenger app. Facebook Messenger app is widely used for business transactions in the country, easing engagement between businesses and consumers. Due to its demand for businesses, PayMaya and GCash, two of the country’s top mobile money service providers teamed up with Facebook Messenger to launch payment option in its application which would cater to remittances, payment bills and mobile data purchasing. Apartment Eight Clothing and Sunnies Studios are the top 2 most followed e-commerce shopping on Instagram, both actively co-brands their label with celebrity endorsements which easily becomes an instant hit on Instagram. Meanwhile, Sunnies Studios owned by celebrity and entrepreneur: Georgina Wilson, Martime Cajucom, Bea Soriano Dee and Erik Dee has a product-centric marketing approach on their social media accounts. Sunnies studios has three different pages on all their Instagram, Facebook and Twitter accounts. Studios Sunnies showcases their fashion eyewear and other retail clothing while Specs Sunnies showcases their prescription eyewear. Metro Sunnies, on the other hand, features their followers’ photos wearing their label making it their most followed Instagram and Facebook pages. 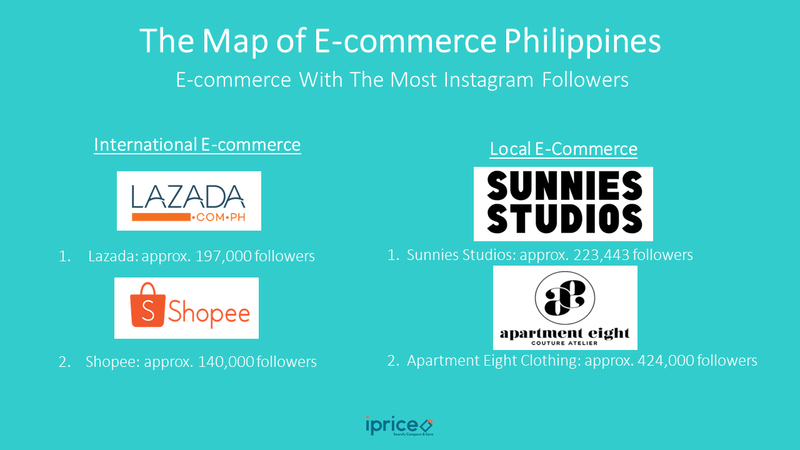 For international players, Lazada and Shoppe are the third and fourth most followed e-commerce on Instagram. Most of the 21-fashion e-commerce on the list (including Lazada and Shopee) carries brand less fashion items from their independent merchants. The regard for brand less culture in online shopping suggests that social class E still represents a bigger market for low cost apparel despite the growing population of high income earners in the country. 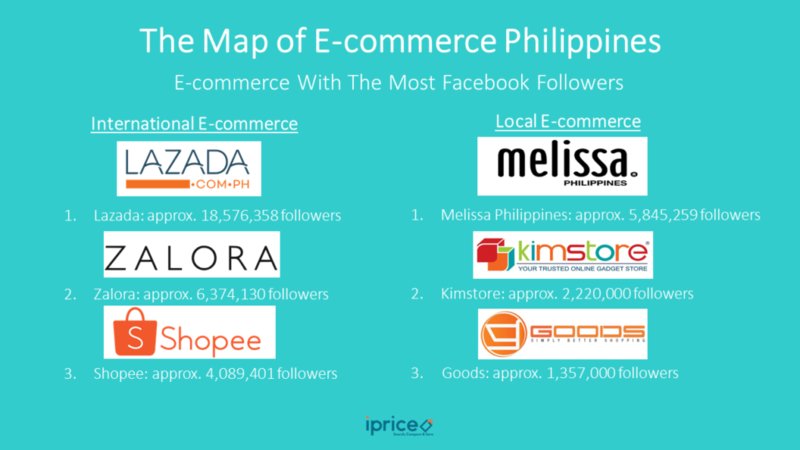 Lazada consistently topped the e-commerce both for website traffic and social media followers. According to Lazada Philippines’ CEO Inanc Balci, they are utilizing social media platforms as a strategy for retail innovation. Lazada’s Instagram strategy directly connects their merchants’ Instagram accounts to their website, which would automatically sync all their merchants’ products to Lazada’s website. Similarly, Lazada is implementing the same strategy on Facebook. On the other hand, seven (Sunnies Studios, Apartment Eight Clothing, Melissa Philippines, The Lifestyle Store, Sunday Dress, Zeus, Dress PH, and Little Emily Shop) out of the 22 fashion local players started out not having their website- only utilizing Facebook and Instagram. In 2011, Multiply, was the most popular social media platform for independent merchants to leverage their products online at zero cost. Since then, the behavior of the Philippine e-commerce leaned towards social media integration. To date, the popularity of Facebook and Instagram is an opportunity marketplace for e-commerce and independent merchants alike especially that Filipinos are the number one who spent time on media.